In the back of the album booklet a statement about the source of the music on this disc reads: “Recordings based on a series of live performances at Helsinki Music Centre, Finland...” The words “based on” suggest to me the possibility there were also studio sessions involved, whether to edit out certain parts that did not satisfy the soloist and conductor or to replace sections where there was audience noise. But then the recordings might also have been derived from several live performances spliced together. Whatever the case, you don’t notice any edits or indications of live concert conditions. Moreover, the sound reproduction is well balanced and very clear, in the end the results aurally being quite excellent. How are the performances, though? Quite excellent, too. Christian Teztlaff has recorded the Bartók Second before, with Michael Gielen and the London Philharmonic in 1990 (released on Virgin Classics in 1991), and that effort was generally well received. I have not heard it, but I would bet it does not better this new performance: Tetzlaff plays with all sorts of nuance in his phrasing and dynamics, everything well thought out without sounding calculated, the music flowing naturally but with feeling and, where appropriate, intensity. Understandably, the disc opens with the Second because, let’s face it, it’s a giant in the repertory, while the First, an interesting and compelling early work, does not rise to the same artistic heights. Tetzlaff phrases the main theme in the Second’s opening movement with a lean but ample tone and conveys a slight agitation and unsettled sense. He seems to put feeling into nearly every phrase, every note, and throughout the movement he effectively captures the numerous mood changes, not least because he possesses a technique that is fully up to every challenge in this difficult concerto. His tempo choices here and throughout the concerto are in the moderate range, but Tetzlaff always manages to impart a thrust to the music in the faster and livelier sections and passion or intensity to the slower parts. Notice his subtly nuanced dynamics in the phrasing of the second movement’s main theme, especially on its return near the end. He gives a sort of brusque treatment to the finale’s main theme, but it works just fine and his account of the movement on the whole is full of energy and color. 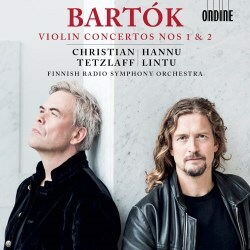 What helps make this a truly outstanding account of the Second is the contribution of Hannu Lintu, who draws an excellent performance from his Finnish Radio Symphony Orchestra. I especially liked the brass section throughout: try the ending of the finale where the brass play with a cutting-edge style that suggests neither bombast nor blandness, as can happen under the direction of a lesser conductor. The First Concerto, consisting of just two movements, is a more lyrical work which was composed by a smitten Bartók for the young violinist Stefi Geyer, who neither returned his affections nor played the concerto. The first movement is a portrait of Stefi and features much passionate, beautiful and mostly slowly-paced music conceived in a style tinged by Scriabin and maybe Richard Strauss. That said, the music is only vaguely suggestive of theirs, as it also looks ahead to Bartók’s own “night music” style. The lively second movement has a tougher veneer and is more colorful and varied. Once again Tetzlaff plays with a passion and intensity that make as strong a case for this concerto as I’ve previously encountered. Lintu and company provide excellent support too. As for the competition in the Second, there are many splendid versions, among them those by Anne Sophie Mutter on DG (where she exhibits an especially powerful tone), Tedi Papavrami on Alpha, Viktoria Mullova on Philips and, if you can find it, the apparently out-of-print David Oistrakh version on MK with Gennady Rozhdestvensky, which first introduced me to the work in the early 1960s. If I had to choose one of these, I’d opt either for Tetzlaff or Mutter. My library in the First isn’t as deep, but of the several recordings I have there are fine versions by György Pauk on Naxos and Dénes Kovács on Hungaroton. I would, however, favor Teztlaff in the First, both for the performance and its first rate sound. A fine release then, and a definite front runner in the Bartók violin concertos.